Ronin is an artist whose dedication to his craft and integrity has established him as one of the leading lights in the region, while mainly being a Beirut regular. Having made a name for himself as one half of dynamic duo Ronin & Nesta - thanks to a handful of high profile gigs and key releases on Hypergroove, Family Matters and Mile End Records - he has achieved a level of quality and discipline in the craft that is unsurpassed. Over the years, he has built a trust with House music lovers, becoming a solid staple and enabling him to play alongside the most vibrant and forward thinking artists in the business, including the likes of Marco Carola, Tale Of Us, Apollonia, Craig Richards, Martin Buttrich, Sasha, Luciano, Josh Wink, Magda and John Digweed to name just a few. One of the things that set Ronin apart is his sense of originality: always a step ahead of the game, he has constantly strived to be the best he can possibly be. As a DJ, promoter, club booker, label manager or brand strategist, he has proven himself to be a remarkable talent. With over a decade in the scene, his contribution to some of the most exciting and successful projects around is a testament to his hard work and dedication. All in all, he is an interesting breed: a thinker and ideas person positioned somewhere between logic and originality. As a DJ, Ronin has developed and pushed a style of his own. Acquired from staying true to the roots of House, and with an eye on the dance floor, his sound easily sits between modern and old school House: keeping it warm, emotive and stripped back, with bags of groove and smiles. Comfortable playing big rooms as he is playing small intimated clubs, he has played for Circoloco, Cocoon, Supernature, Bedrock, Cadenza, Half Baked and FACT, as well as the Creamfields Festival in Abu Dhabi (2012-2013-2014), the Paris Technoparade (2010), the Sandance Festival (2011-2012) and Off-Sonar Barcelona (2013-2014). All this apart from his combined 5 year residencies at The Basement Beirut, Uberhaus and The Garten, not to mention the rest of his various sits and gig in Europe. As a party promoter, Ronin is the main man behind Beirut based artist collective, party brand and radio show, Beirut In the Mix. For almost 10 years now, the brand lives on with successful monthly parties, a podcast, and a weekly prime-time radio show on Mix FM Lebanon 104.4, cementing its place as the pre-party warm up for Beiruts underground. He has made his beloved Beirut In the Mix the platform for him and Nesta to invite the likes of Seth Troxler, Maceo Plex, Josh Wink, Deetron, Terry Francis, Paul Loraine, Wareika and Hold Youth for memorable parties and guestmixes - thanks to which Beirut In the Mix has earned a steady and solid reputation in the scene. 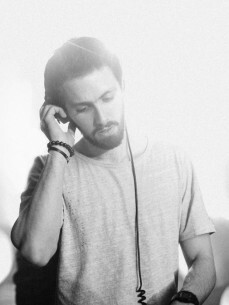 As a club booker, Ronin’s determination and musical direction is responsible for bringing to Beirut the sound of the biggest names in electronic music: from his early days inviting Global Underground and Ministry of Sound, to slowly evolving into booking the likes of Apollonia, Craig Richards and Djebali, building solid relationships with those established figureheads. As a label manager, he has partnered up with his good friend Salah Sadeq to re-launch the 15 years old Techfui platform; bringing family, friends and fresh talents together, and building a strong relationship of honest musical expression. As a brand strategist - and when he’s not playing music or partying - he spends most of his time running Andco, a collaborative creative agency in Beirut spanning between design, digital and film projects, and delivering work of very high quality and integrity. With such an extensive list of achievements and tasks, you could forgive Ronald for not finding enough time to create music at the studio. But no matter what path he had to take to get his point across, is values and ethos remain the same since he has started: modesty, creativity, dedication and ambition.